At a time when the word 'sustainability' -- due to its wide use and misuse -- has come to signify confusion more than anything else, the book under review is a valuable contribution. It explores the concept and analyses cities across the us that have formally developed urban sustainability programmes. The book attempts to locate the factors responsible for the development and operation of sustainability programmes. Some of the key questions posed are: What is sustainability? What does it mean to take it seriously? How seriously are cities pursuing this? How does one measure it? The book does not strive to answer each of these questions. Instead, it treats them as means to a greater end, provoking more thought on the subject in the hope of eliciting more action. Portney explores the conceptual foundations of sustainable cities, discusses key components of sustainability, develops the idea of a 'serious sustainability indicator,' presents a comparative analysis of some sustainable cities, and ends with more questions. What is 'sustainability'? The book begins by expounding the contemporary significance of sustainability by building on the work of the Brundtland Commission and integrating ideas of "ecological carrying capacity" and "ecological footprint". According to Portney, sustainability implies maintaining the earth's carrying capacity through a modification of individual and collective behaviour. It is not just an environmental concept but an ethical principle as well. It is the search for a peaceful coexistence between economic development and environmental protection. A sustainable city is one that strives to promote some operational vision of sustainability. A large section of the book is devoted to discussing essential components of sustainability, which include environment and energy, economic development, participation and equity and social justice. According to Portney, the pursuit of sustainable cities is a political process requiring citizen participation and increased civil society involvement. The discussion on the relationship of justice to sustainability is critical. Though the author believes that it is unlikely that a city could ignore equity issues and still take sustainability seriously, there is little evidence that cities have successfully addressed issues of social justice and environmental equity in their sustainability initiatives. Since sustainability is a multidimensional concept, Portney believes it needs multiple indicators. 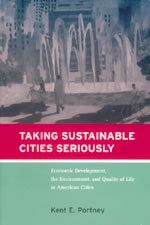 What is different about this book is its systematic comparison of cities through the development of 34 tangible indicators, which include renewable energy use, inner-city public transit, hazardous waste recycling, and water conservation. These help prepare the "Taking Sustainability Seriously Index", used to grade sustainability initiatives of cities and explain why some cities take the idea more seriously. The book finally presents an in-depth comparison of eight cities that seem to be taking sustainability seriously. Through this, the author underscores the linkages between the theory and practice of sustainability in order to build causal hypotheses. While the indicators are functional markers of sustainability and prove useful for comparison, the empirical analysis is complicated and its validity uncertain, given the large number of variables across cities. How a city defines sustainability influences its initiatives. For instance, Portland, San Francisco, and Seattle seem to have a broad understanding of the term as they have integrated concern for economic development, the environment, and quality of life across all activities of city government. Optimistic tone The book concludes that even when implementation indicates a commitment to sustainability, empirical evidence does not necessarily prove a direct correlation. The underlying tone of the book however, is optimistic and holds prospects for the transformation of the world into a sustainable place. For those interested in further understanding the practice of sustainability, this book is beneficial. Though limited to an analysis of American cities, the ideas transcend geography and could benefit urban planning anywhere. It is particularly important for city planners, students of urban studies and city government officials. Though slightly repetitive in parts, the book on the whole is easy to read, and has interesting replicable examples. Given the low level of awareness on sustainability in Indian cities, it is doubtful if the issue of sustainability will be taken very seriously. In such circumstances, an indicator to measure the seriousness of the commitment to sustainability might be premature. As the author points out, cities that need sustainability the most tend to take it the least seriously. Indian cities have a long way to go. Perhaps this book could help fast-forward the process.